This is the way (well, kind of) Vodafone, then EE shortly after, have broken up with Phones 4u, compromising its future as a profitable business. Claiming their will to establish a stronger, more direct link with consumers, UK mobile networks seem to have started a trend towards consolidating their sales channels. It’s not simple to imagine what the implications will be, and whether it’s leading to a potential market collapse. Phones 4u owner and founder John Caudwell has accused the networks of “collusion,” Tweeting of a “co-ordinated attempt to kill off” the independent retailer and asking authorities to scrutinise their behaviour. Operators like EE see it as a change in their sales strategy, driven by “developments in the marketplace” and their need to repay the costs of infrastructural investments in ultra-fast broadband and LTE networks faster, by cutting resellers’ commissions. Phone manufacturers (OEMs) find themselves without a key customer, which makes an immediate impact on their distribution strategies. iPhone 6 pre-orders were cancelled by Phones 4u, which will affect investments already made in the UK retailer (e.g., marketing, permanent fixtures and merchandise). Setting aside plot theories, Vodafone and EE (as well as O2 and Three) emerge as immediate winners: one big retail competitor is gone and they will probably buy the best locations at a “very friendly” price — good news for thousands of Phones 4u employees (sadly, not for all), but could we say the same about the mobile retail market? Is Dixons Carphone, a dead man walking now? John Caudwell, in another of his raging Tweets, foresees a similar destiny for the only remaining UK independent retailer, as its profitability relies on the same business model (i.e., a bunch of big suppliers responsible for 80% of revenues). After the Dixons Retail-Carphone Warehouse merger, that retailer might not be as fragile as Phones 4u was. Actually, Dixons Carphone could represent a key partner for mobile networks in the future: the Internet of Things is literally happening NOW, with a growing number of gadgets, “wearables” and home appliances imagined to exist as always-connected-devices. If Operators want a slice of that data plan, they will need to form ties with someone like Dixons Carphone, leveraging their retail presence to drive sales. Not least, Dixons employees’ good reputation in nurturing customer relationships and extensive product expertise (beyond mobile phones) is a precious asset and one Operators are happy not to sustain the cost of. On the other hand, consumers’ risk of losing bargaining power surely exists, but for now it might be slightly overrated. The collapse of Phones 4u represents a shift in shoppers’ behaviour. 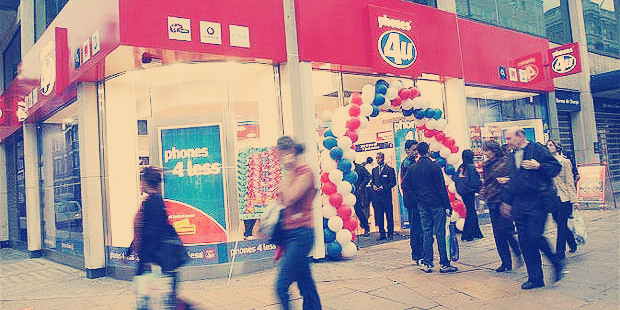 As a physical showroom, Phones 4u was providing a service nowadays replaced by online comparison websites. In addition, it was also slow to reimagine how to service a global market where the subsidisation of mobile phones is less of a norm (T-Mobile and AT&T in the USA): a fatal combination of short sightedness and bad planning. The evolution of smartphone technology, wider choice of models available at any price range, and proliferation of inexpensive MVNOs (Mobile Virtual Network Operators) is changing the way we shop the category. Once driven by how many free minutes and SMSs we could get for £x, the choice is now based on preference for smartphone brand and model. Once shoppers purchase an unlocked device, they can turn to the most convenient tariff plan: a process that can start and finish online. The opportunity for OEMs appears clear, as they could also benefit from the gap left by Phones 4u and build a closer link with shoppers. Some might decide to cherry-pick the best-located stores vacated by Phones4u to grow their High Street visibility, a move that wouldn’t make sense without also increasing their digital presence and strengthening both their investments in e-tailer platforms (Alibaba IPO, anyone?) and their direct sales channels. And if the EU and other authorities were to turn the recent networks’ moves down (anti-trust regulations), “richer” brands like Apple or Samsung might decide to read the situation as a chance to step in as a Virtual or Physical Network (a fancy “Galaxy Network”) with compelling offers tailored to get even closer to customers and how they use their devices. A step away from the edge of the cliff. Ultimately, the whole story is not shockingly new. Strong brands crave ownership of the relationship with consumers from start to finish: it’s the Holy Grail of marketing. Mobile Operators saw the opportunity to do so — it would have been foolish not to. Apple’s success relies heavily on this strong relationship. It’s a success based not only on inspirational keynotes, beautifully designed products and futuristic stores, it’s built on well-working call centres and effective customer service (e.g., fast device replacement. Not being in full control of the conversation with consumers exposes brands to potential flaws across the purchase cycle. Understanding that, Vodafone, EE, O2 and Three took a step toward nurturing THEIR relationship with THEIR shoppers — a step away from the complete commoditisation of their services — towards higher margins and ARPUs, increasing the value they can deliver to their customers through a total brand experience. Will smartphone manufacturers see this as an opportunity to take a step in the same direction? It could not be a better time to do so.